Ever since I ordered my papaya tree way back in frosty, icy January, I’ve been looking forward to this day with an ever-increasing amount of impatience. When I was placing the order, I figured the delivery would necessitate, at a minimum, two burly men, a truck, and some sort of forklift to get my papaya tree situated in its new home. Imagine my disappointment when I made the daily trek to the post office, only to be presented with a smallish green plastic package, so light I could carry it with one hand. When I got home and opened it, I discovered that reality refused to meet my dreams even halfway as I unpacked the saddest, wiltiest, most despondent two-inch papaya tree I’ve ever seen. Granted it’s also the first papaya tree I’ve ever seen, but still. 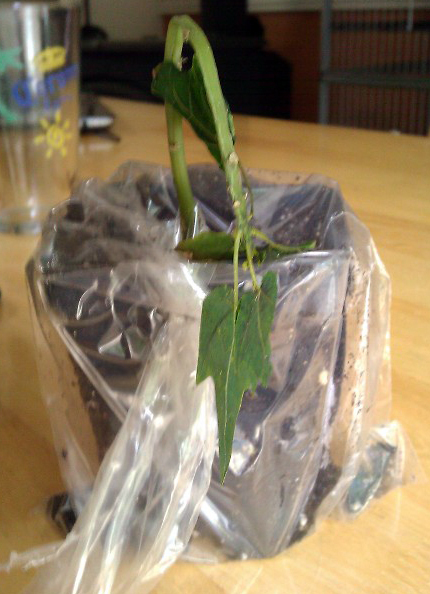 The poor thing is so traumatized that even though its two leaves are still green, you can literally see through them. I had to check it into plant ICU, where it has its own room complete with a protective plastic bottle bubble and a splint made of shrimp skewers and a twist tie. I also called the company, who said they would send a replacement papaya, but only if I stopped crying. Also included in what I’m now calling my Order of Crushed Dreams was the three-in- one citrus tree I was elated to stumble across back in January. I pictured a single grafted tree of Frankensteinian elegance, with a selection of lemons, limes, and oranges on every branch. But apparently by “3 in 1”, they meant three separate trees crammed into one pot. That’s the sort of thing I do by accident every time I plant seeds, not something they should advertise as a glorious hybrid citrus celebration. 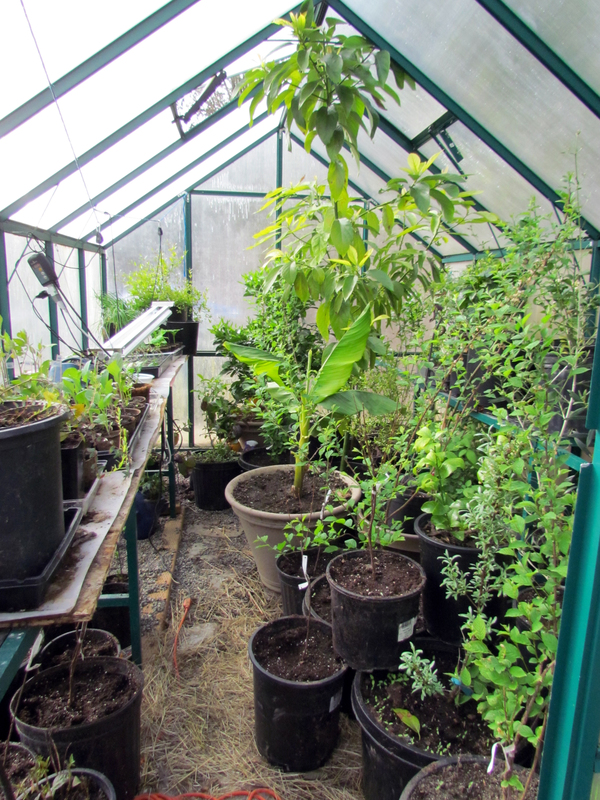 I briefly considered separating out the three trees into different pots, but then shrugged and decided to keep the citrus party going. With all my new acquisitions in pots, plus a few more “had to haves” I saw at the huge Wilco sale today, my greenhouse is officially at maximum capacity. It’s hard to tell from the photo, but along the right side pots are stacked three and four deep. In my infinite wisdom, I left the two plants with spikes on them along the aisle, so I get a pointy hello every time I turn around in there. I discovered something else as I was unpacking the rest of it – ten asparagus plants that I’d completely forgotten I’d included in my order. Every time I’ve seen an asparagus for sale, I’ve thought, “Ooh, asparagus! I should try growing that!” and I’ll throw a package of it in my cart. Then forget about it. Times five. Now I have over thirty asparagus plants for which Gene is going to have to build a raised bed. Good thing we have over 12 yards of dirt to use! I just wish he actually liked asparagus.